We’ve had such an up and down summer here in Seattle that it’s been a bit hard to get the real feel of the long, lazy dog-days of summer. And that has made it twice as important to take advantage of the good days when all the elements – sun, heat and a bit of free time – come together in the perfect convergence. Several weeks ago my friends MG and DW slipped a bottle of rosé on the backseat of my car sometime while I was at their house. Such a great surprise when I found it! This wasn’t just any rosé but one they’d been telling me about, produced by Grochau Cellars (GC). (Full disclosure time… MG’s brother and sister-in-law own GC and make the wine.) Once I’d found the wine it went directly into my fridge to be chilled and ready to go at a moment’s notice. The perfect time finally arrived about a week and a half ago. I had nothing on the agenda, the sun was out, it was perfectly warm with just a little breeze coming in from Puget Sound, and the lawn could really wait another day or two to be mowed… So I opened my treasured bottle and settled myself on the deck, cats at my feet and a glass of gorgeous rose-colored rosé in my hand. The wine is called Pink and it’s a rosé of Pinot Noir. As mentioned, and you can see in the photo above, the color is a pretty intense rose with just the slightest copper nuances. The nose is most definitely strawberry – wild, mountain strawberry. The kind you have to hunt to find but once you do, the intense flavor makes the search worthwhile. With that big hit of strawberry I was a bit worried the wine might be a bit sweet. Silly me. This wine is delightfully crisp. The flavor is not as much strawberry as the nose is. There is some but maybe a little tart cherry, too. 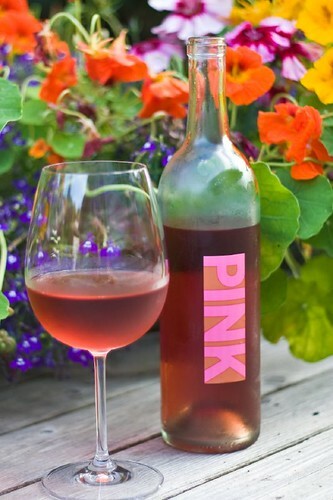 It seemed that as the wine warmed a little it actually had hints of pink grapefruit – very nice. As it leaves the palate there is just a hint of flavor remaining. It doesn’t linger long, but that’s okay. Like the warm summer days the best rosé is often fleeting – meant to be drunk young (you can be any age but the wine is best young! ), and a refreshing thirst-quenching respite from the heat. And that heat could come from the sun or from something spicy and this wine would be nice with both. I’m not sure how available this is this year. (Sorry!) I think you can find it some places in Oregon since GC is based in the Willamette Valley, but I bet there will be more next year. So make a note of it and keep your eyes open next spring.